BUTTE COUNTY, Calif. – A fast-moving wildfire is forcing evacuations in northern California. The Camp Fire was first reported at 6:51 a.m. on November 8 in the area of Camp Creek Road and Highway 70 in the Feather River Canyon. At the time, it was estimated to be about 10 acres. The fire started at a time when the area was under a Red Flag Warning, a state of heightened alert due to fire-friendly conditions. Less than an hour after the Camp Fire was reported, the Butte County Sheriff’s Office issued an evacuation order for the entire town of Pulga due to the fire. At 8:02 a.m., the Camp Fire ballooned to 100 acres as dozens of resources from throughout California were dispatched to the area. By 9:54, CAL FIRE said the Camp Fire was estimated to cover 5,000 acres. Anyone near the fire was urged to evacuate. 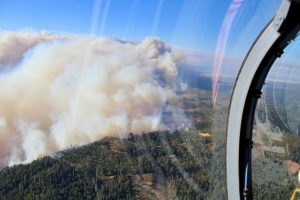 At about 2:30 p.m., the fire was estimated to be about 18,000 acres. The communites of Paradise, Magalia, Concow, Butte Creek Canyon and Butte Valley were ordered to evacuate.